Simply one man's opinions, for what they're worth. Everyone's perceptions of aesthetic beauty differ, as the aphorism goes "Beauty is in the eye of the beholder (or beer-holder!)" Trunk racks themselves look fine as long as it's folded neatly against the back. It's those big boxes hanging on the back that spoil the proportions. In the Mercedes world a factory rear spare car (which was almost always double spare) will bring much more money than the side mount cars. Usually the rear mount cars had set back radiators which of course added to the lengthened appearance. Don Olsen's 1931 Victoria 8 -31 has the spares mounted on the back . His car does show very well like Steve explained with the sweeping lines . Just as Steve says, "beauty is in the eye of the beholder", though I personally favor the trunk racks in place, folded without trunks. To add a bit more controversy, and only this beholder's opinion, on long fender cars, I like the sidemounts, but not on shorter ones. According to Joe Asuchak on his 1931 Reo Royale Victoria 8 - 35 He has an original trunk from the factory made by Beals & Selkirk . From reading the article it describes the construction of a variety of trunk manufacturers . 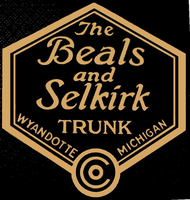 It seems Beals & Selkirk where a high end manufacturer of car trunks .There is a good picture of the trunk and Joe's Royale on page 3 . We have a source that will reproduce these emblem at $18 per emblem plus shipping .